1Password 7 for Windows Release Candidate is here and yep, it is totally lit. Guys, it's here. It's finally here. Our first release candidate of 1Password 7 for Windows and best part is yet to come. You can now buy licenses for 1Password 7 for Windows and register it right from the store. We've made a lot of improvements in this update because in addition to supporting licenses, we're also making it easier to migrate your standalone vaults to your new 1Password account if you add the standalone vault first and 1Password account afterward. [IMPROVED] In the item's tags field, nested tags are now included in the auto-completion list. [IMPROVED] After converting your legacy Agile Keychain vaults to OPVault format, 1Password will rename the Agile Keychain folder extension to .legacyagilekeychain. [FIXED] Watchtower was not able to update its database in certain conditions. Hi @MarcoZ, I wanted to ping you to let you know that we've made a lot of accessibility improvements to both the main 1Password app and especially the 1Password mini, please give it a try and let us know if there's still anything we've missed. Hi @MikeT , I've been running the beta (still standalone) and it's a vast improvement over 1P4. I'm a little unsure of my best purchase option though. I had a 1P4 family license as my wife and I use all the computers, however we only ever used one vault. Now I can choose to upgrade to 1P7 Standalone, so do I need to buy two licenses (one each for the same vault)? Each license costs a similar amount to the family subscription (but of course is one-off) so I'm unclear on what my options are. A bit more info about my environment below. A minimum of 4 computers at any one time, all Windows. A minimum of 2 phones, all Android. One vault synced between all devices, historically as local vault but experimenting with Dropbox. I currently have the 1P4 family licence and have also licensed the Android app on both phones so I've essentially already paid for the subscription "access anywhere" features, but want to upgrade 1P4 to 7... I guess the main question is just whether I need one standalone license per user, or just per vault (since we share the same vault and Windows logon etc). @wraith: Indeed, 1Password is sold per-person, so you'd need a separate license for each of you if you go the standalone route. It does sound like Dropbox would work for you...but I will say that I felt the same way until I tried 1Password Families to get my own family on board using 1Password more. They had in the past, but basically only when I nagged them to. This actually got them using it much much, and without complaining! And, in the process, I found that I rather liked the simplicity of 1Password.com both for my own use and because it reduced "support costs" (i.e. family members needing help). Just my two cents. Totally agree with you Brenty. Not having to configure Dropbox on all devices was a real bonus when more than one family member was involved. Having it installed means now people will use it and automatically having a shared vault is useful if you want to share a login account (e.g. a shopping site) without sharing your whole private vault (my wife like to log into my HHonours account to see where she can use my points - storing that in the shared vault makes it really easy). Indeed, it's saved me more time than I will ever really know! I've bought the license today! I've been using 1password for 2-3 years in my mac and iOS device and I have one woro to say: AWESOME!!! Definitely awesome, thank you for buying the license. The best part is yet to come, so much features we want to implement soon. However, after my first attempt at removing tags, usually 1-2 tags in a group (e.g. banking & money) remained and needed another removal pass. In the case of my Software Licences tag group, it's needed multiple removal passes (only 5-6 items are removed after each pass). Just wondering if this unique to my account, and whether I can provide any information to help you understand why this is happening? I use 1Password on windows, macOS, android & iOS. How long did you wait before you try again? If it is a lot of items, it may take a few sync calls to update all of the items. I'm not able to reproduce this but please do send us your 1Password diagnostics report, use this guide to generate the report and email it to us at [email protected]. Also, in the email, include the link to this thread along with your forum username, so that we can connect the email to this thread. Hi @MikeT - I noticed that the items, while being detagged, would go into Offline Changes temporarily, so I waited for them to leave Offline Changes before trying again. I've generated the report and emailed it to you, so will look forward to your response there. Thanks, we got the report and will reply there as soon as possible. Click Retry to try again, Ignore to skip this file (not recommended), or Abort to cancel the installation. I've just booted my computer, so I've no idea why it's giving me this message as I haven't touched anything else other than 1password when trying to update. I've also disabled the 1password desktop extension from chrome, to no avail. I've updated through my laptop by uninstalling/reinstalling, though I never saw the option to purchase the standalone license leading me to think (I highly doubt this is the case though, as I'm probably overlooking something simple here) this can only be initiated through upgrading and not with a fresh install. I'm currently using windows 10 Pro (Education edition on my laptop) 64 bit, with 1password extension (desktop app required). EDIT: A further bit of research shows this could potentially be due to anti-virus, though I've temporarily disabled all of my anti-virus for this, though it yields the same results. I'm currently using Avast 18.4.2338 and MalwareBytes 3.5.1, as well as periodic scanning with windows defender. What anti-malware solution are you using? 99% of the times, it is caused by the anti-malware solution scanning the 1Password files while 1Password updates. Thank you for the quick reply! I've edited my above post with the details on that. @cellsheet: Indeed, both of those are known to interfere, especially with regard to deleting, quarantining, or denying access to files needed to run and update 1Password. Try booting into Safe Mode with Networking without those running and see if the issue goes away. Ah, I actually just uninstalled/reinstalled it on my desktop as I found out I just had to logout in order to purchase, so now I've got the standalone license now at this point! Super happy with 1password! Glad that did the trick. Thanks for the update — and for your support! We're here if you need anything else. I have been a long-time 1Password standalone user w/ passwords synced between my Mac, PC and iOS devices. I've been using the beta on my PC and it'd been fantastic, love the changes. I just wanted to be sure that if I buy the new standalone license of $40 that I can use this same license on my PC, Mac and iOS devices and that I don't need to buy a new license for each platform right? If so, how do I access the discounted price? I saw one popup on my PC this morning, but it looked like it was going to charge me the full price, now I can't seem to find that screen again. Since this is already in RC, and the free beta period ends May 25, I'm concerned that I still cannot create a new standalone vault on a fresh install. I am ready to buy 5+ licenses at work, but we will need to create/use local vaults only. When do you expect the ability to create a new standalone vault on a fresh install? The RC build already have this if you apply a license first, it will be required to have a license or 1Password account to create a new standalone vault. Here's what it looks like with the license applied first, the Create a new vault on this PC option on the bottom there. We have a bug where the options in the 1Password menu are still disabled even in the RC build. This is going to be fixed soon. Go to the 1Password menu > License, you'll see the option to buy now. It is normal for it to show the full price, it's static right now but if you click on it, it'll open the store in your default browser and show you the beta price. We're trying to see if we can update the price properly in the app soon. I just wanted to be sure that if I buy the new standalone license of $40 that I can use this same license on my PC, Mac and iOS devices and that I don't need to buy a new license for each platform right? No, you'd need a separate license for each platform, there is no bundled license that works on all platforms and Apple's App Store doesn't have licenses. 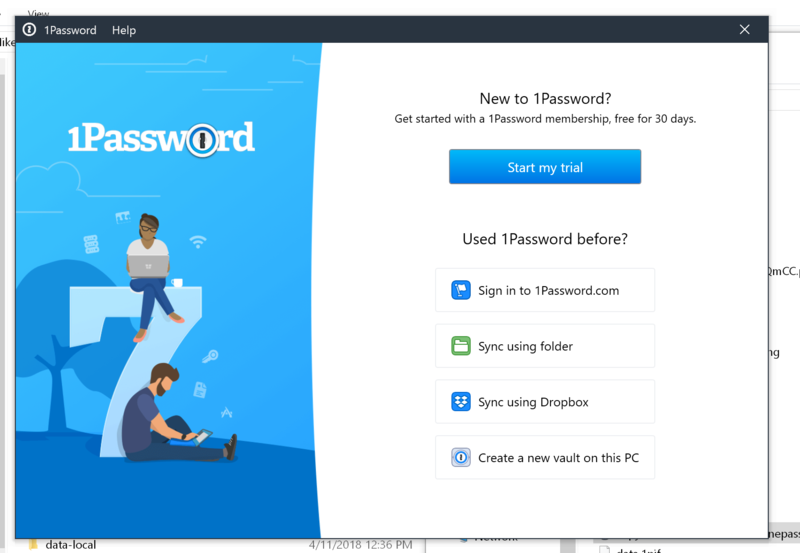 So, you can either buy the licenses separately or get a 1Password.com membership that includes access to all 1Password apps and future upgrades automatically at no extra cost. You can find out more here. I've been meaning to get my wife and in-laws on 1Password as well, so I think it may just be easier (and cheaper at least initially) to subscribe to the family plan instead of buying a whole pile of of licenses. Gonna try that now over the next couple of days to make a decision. Is there any sort of discount promo code deal for beta testers who subscribe to the family plan? It's alright if there isn't, just figured it was worth asking before doing so. In case you might not be aware, it is 30 days free for all new 1Password accounts. Please email us at [email protected] for that answer, I don't think there is a discount because 1Password 6 stable has been available for a while for 1Password accounts. Thanks again @MikeT Yeah I only meant a couple of days in case I still wanted to go with the discounted stand-alone license, I did see that you get a 30 day trial. Sorry for the confusion. You're welcome, let us know if there's anything we can do. I have been using the Windows beta for a while and it works fine. Coming from long time use on Mac & iPhone synced through Dropbox I expected updating the master password on the Mac would also apply to the Win machine as it does to the iPhone, but no it does not. And I do not have an option to change the master password on the Win machine. Today I purchased a stand-alone license (which was always my intent) thinking that would unlock an option but if so I cannot find it. I change my master password monthly and if there is a technical reason the Win machine must be changed separately then so be it, but at the moment I have a licensed version with a password some months old. By the way all the data syncs OK, and I do like the face recognition feature but I would also like to control my master password..thanks. There's no UI setting to change the master password yet, it's coming in a future update. Generally, our advice for 1Password master password is that you set a strong password and that's it, you almost never have to change it again. It's not stored anywhere because it is only used to decrypt an encrypted but unique strong encryption key that's stored on the disk. Is there a specific reason you're changing your master password once a month? There's rarely any reason to change your master password as long as it is strong in the first place and you're not writing it down anywhere. Your master password isn't stored anywhere and your data is protected with strong encryption protocols, so it is not the same practice as changing your web site account, which is used for authentication and not usually stored in an encrypted fashion. Wow. FINALLY. It just works again, at least on Windows! Going to update 1p for OSx next,keeping fingers crossed.... Maybe, after over 3 years, my vaults will FINALLY sync properly between iOS, OSx, and Windows. I hope..... Thanks for the ding, folks. Took a long time but looks like it may well have been worth the wait! Thanks for writing in. I'm sorry that it did take us that long to make OPVault finally work for you on Windows and hopefully the rest of the platforms too. Is 7 on Windows supposed to have the same markdown support as 7 on MacOS as when I edit one of my items and click on notes I'm not getting any way to change how the text looks, e.g make it bold etc.